To mark the second anniversary of the 2016 EU Referendum Survation’s latest poll on behalf of Good Morning Britain explores public opinion on several current issues surrounding Brexit – the debate over the Irish Border, a ‘hard’ or ‘soft’ Brexit, and whether the public should get a say over any ‘final deal’. Significant percentages (36%-43%) of respondents have a ‘limited’ understanding of the Customs Union, Single Market and the difference between them. 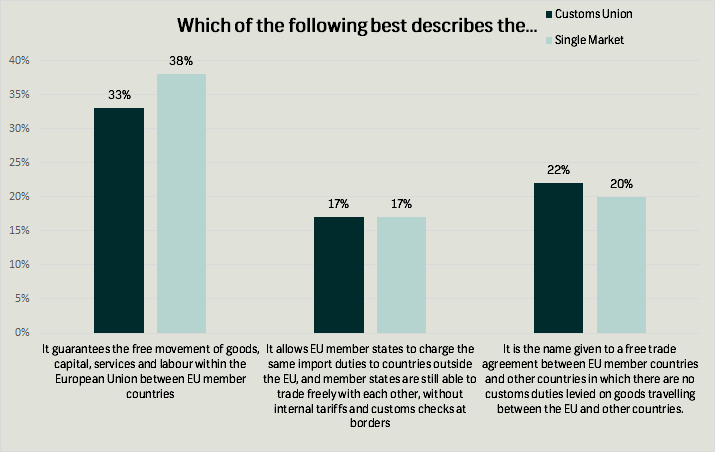 However, more respondents identified the correct definition of single market (38%) in comparison to the correct definition of Customs Union (just 17%). More respondents prefer a ‘soft’ to a ‘hard’ Brexit (43% vs 37%). Nearly half (47%) believe that leaving the EU without a deal would be bad for Britain (compared to 32% for ‘good’) and only 35% of respondents believe Brexit will be good for the UK economy (compared to 39% who said it will be bad). Nearly half (48%) of respondents support a referendum on the final deal (compared to 25% opposed) and 40% believe that there will be a Brexit ‘dividend’ (compared to 37% who felt the opposite). The poll also finds that if the referendum was rerun today the UK would remain in the EU, for the first time since March. 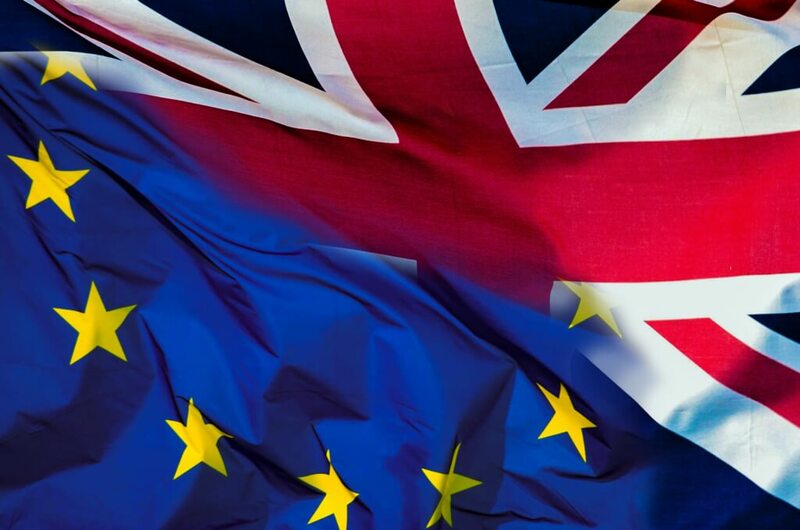 Respondents were asked which version of a Brexit they preferred, a ‘hard’ Brexit – which would involve the UK leaving the single market and customs union – or a ‘soft’ Brexit – in which the UK would remain in both. 43% of respondents were in favour of a ‘soft’ Brexit compared to 37% who were in favour of a ‘hard’ version, with an additional 20% saying they did not know. 67% of those who voted Leave in 2016 were supportive of a ‘hard’ Brexit; whereas 67% of Remain voters were in favour of the ‘soft’ version. Labour’s Brexit headaches are set to continue as a majority of 2017 Labour voters (57%) prefer a ‘soft’ Brexit and 23% prefer a ‘hard’ version. 47% of respondents believe that leaving the EU without a mutually agreed deal on the terms of exit would be bad for Britain, compared to 32% who felt it would be good. Only 35% of people said Brexit would be good for the economy compared to 39% who said it would be bad, with the rest saying it would make no difference or that they did not know. Those who voted Leave in 2016 are the most positive about the economic impact of Brexit with 67% saying it will be good; whereas 73% of Remain voters believe it will be bad for the economy. Interestingly, there was strong support for the idea of a referendum on any final deal agreed between the UK and the EU, with almost half of all respondents (48%) in support of a vote on the terms of the Government’s negotiated deal. This included 66% of those who voted Remain in 2016, as well as 35% of those who voted Leave. 25% of all respondents were opposed to a referendum, while 18% said they neither supported nor opposed the idea with an additional 9% saying ‘don’t know’. The Leave campaign’s promise of £350 million a week to help fund the NHS proved controversial during the 2016 Referendum and its controversy has not died down, the Prime Minister’s recent announcement has helped rejuvenate the debate. Perhaps unsurprisingly there is only a very slim difference between people that think there will be a Brexit dividend (40%) and won’t be one (37%). 62% of Leave voters believe that there will be a Brexit dividend as promised by the Leave campaign during the Referendum. 59% of Remain voters believe that there will be no dividend; although 22% of Remain voters do believe there will be one. Despite 31% of people claiming to have a ‘very good’ or ‘good’ understanding of the Customs Union, only 17% of people were able to identify the correct definition of the Customs Union. This was the same percentage among both Leave and Remain voters. Comparatively, 38% of people were able to identify the correct definition of the Single Market. Most people said they had a ‘limited’ understanding (between 36% and 43%) of the Customs Union, the Single Market, and the difference between them, whilst a very small percentage of people (just 3%) said they thought the single market and Customs Union were the same thing or said they had heard of neither. When it came to the Irish border issue, nearly two-fifths (39%) of respondents identified themselves as having a ‘limited’ understanding of the topic, while a further fifth (19%) said that they didn’t know anything about or hadn’t heard of the issue. 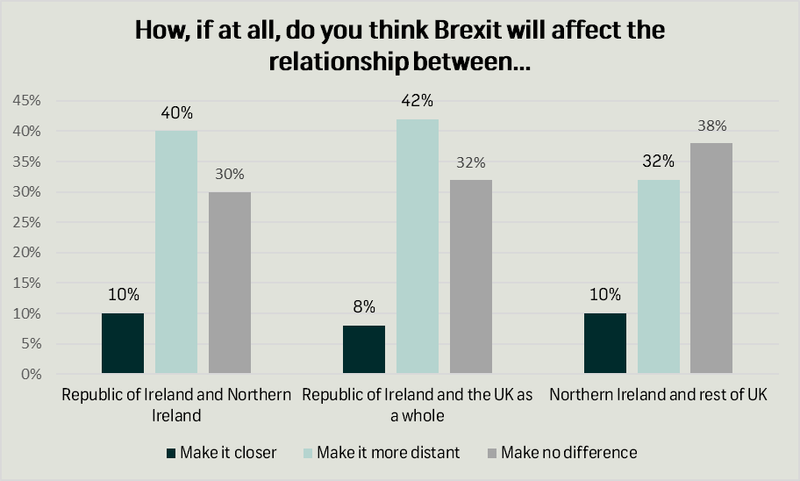 Most respondents (40%) thought Brexit would make the relationship between Northern Ireland and Republic of Ireland more distant. Comparatively, 30% thought that Brexit will make no difference to the relationship between Northern Ireland and the Republic of Ireland, with 10% believing Brexit will make their relationship closer. As well as this, the relationship between the Republic of Ireland and the UK as a whole was also taken into account, with 42% of respondents believing Brexit would result in greater distancing between the two countries. 32% of respondents also believed that Brexit would make ‘no difference’ to the relationship, with only 8% of people thinking that Brexit would benefit the UK’s relationship with the Republic of Ireland. More people (38%) thought Brexit would not make any difference to the relationship between Northern Ireland and the rest of the UK than think it would cause distancing (32%). Interestingly, this poll found that this issue was split between Remain and Leave voters, with 40% of Remain voters believing the relationship will become more distant and 47% of Leave voters believing it will make no difference. In the event of a hard border being established between the Republic of Ireland and Northern Ireland 44% of respondents believed that it would be up to the people of Northern Ireland to decide whether they should remain part of the UK. 33% of respondents said Northern Ireland should outright remain part of the UK and 11% said it should no longer be part of the UK. Comparatively, this poll found there was very little divergence in the opinions of Leave and Remain voters on this issue. Research was conducted online with a sample of 1022 UK Adults aged 18+. Fieldwork from 19 – 20 June 2018. All polls are subject to a wide range of potential sources of error. 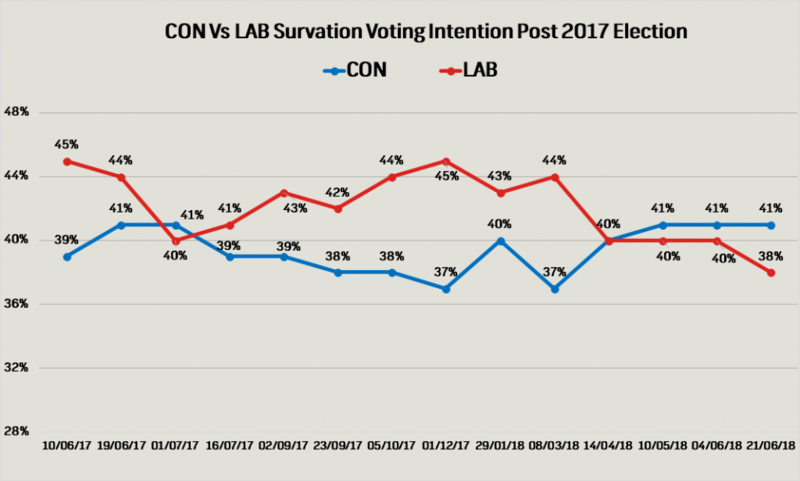 On the basis of the historical record of the polls at recent general elections, there is a 9 in 10 chance that the true value of a party’s support lies within 4 points of the estimates provided by this poll, and a 2 in 3 chance that they lie within 2 points.